120 metres below sea level, the hottest place on Earth - there are 1 million Afaris living in some of the most inhospitable lands on the planet. Yet in this area, due to the splitting apart of the African plate, there are old salt beds which provide a sustainable resource for the Afar and their trains of camels which have been journeying for centuries to extract the salt in Dallol. 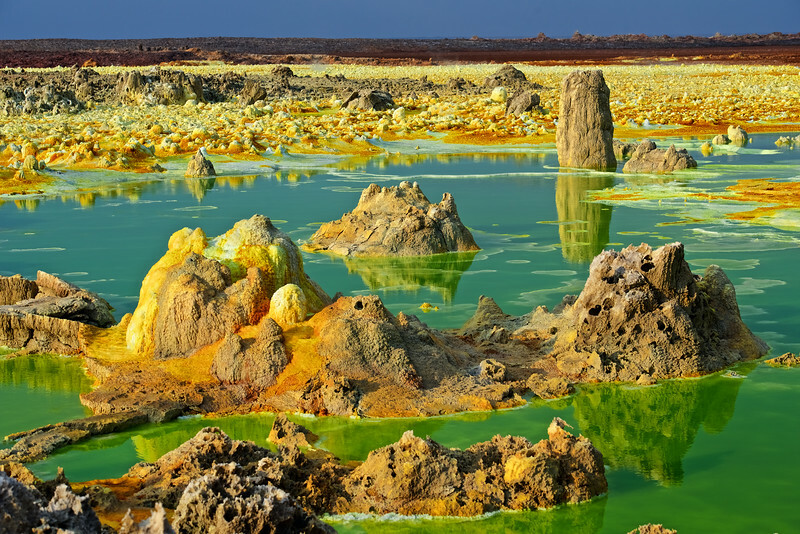 The area also contains some of the most amazing hydrothermal features on Earth. Bizarre fumaroles of sulphur and many other chemicals create a surreal landscape overlying Dallol volcano. A short journey to the South over desert dunes and salt flats the very active Erte Ale volcano is found with it active and permanent lava lake. Difficult to get to but utterly amazing to see. The stars at night and the glow of lava beneath your feet give you an other worldly feeling.